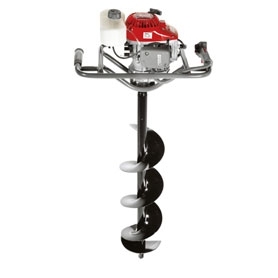 The Efco TR1551 earth auger is designed to drill small holes in every sector (vines and plants, street lighting, fence posts). Powered by a 2-stroke engine with chrome cylinder and forged-steel drive shaft and connecting rod. The engine controls are grouped together on just one hand making them the ideal solution for single-man operations. Safe and user-friendly, it features a direction changer to facilitate bit removal. It is also fitted with foldable handles for easy transport and an automatic cutout that stops the engine should the operators lose control of the machine. Drive unit and bits are sold separately.